Galway and Donegal continue to light up the league as the top flight's runaway leaders both maintained their perfect starts to the season. Sarah Conneally's goal helped Galway to a convincing 1-11 to 0-8 derby victory over Mayo at MacHale Park, while Karen Guthrie, Róisín Friel and Geraldine McLaughlin all found the net for Donegal in their two-point win (3-11 to 3-9) over Tipperary in Convoy. 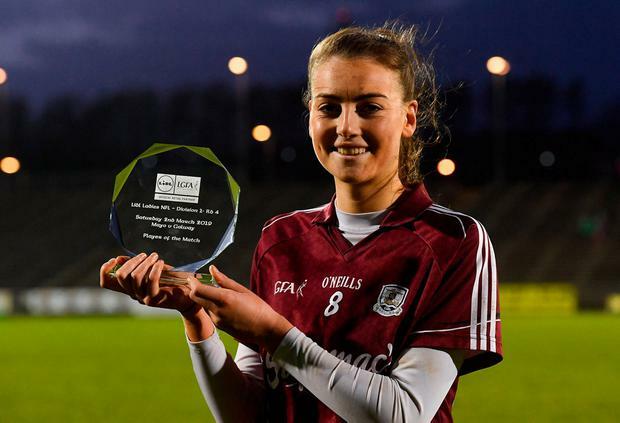 Victories over Mayo in last year's Connacht final and the All-Ireland quarter-final meant Galway entered this league clash high on confidence, and once again Tim Rabbitte's side didn't disappoint with Áine McDonagh giving a player of the match display. Playing into a strong wind Galway still led by two at the break, while Conneally's goal ensured there would be no Mayo comeback. In Convoy, the main action happened in the second period when two goals from Guthrie and McLaughlin opened a ten-point lead. Tipp charged back thanks to goals from Anna Rose Kennedy and Róisín Howard, but Maxi Curran's side held on. Dublin overcame a spirited challenge from Westmeath at the DCU Sportsgrounds (1-8 to 1-3) to make it three wins on the bounce. Despite the best efforts of Westmeath attacker Anna Jones, the experience of Carla Rowe and Noelle Healy helped the Sky Blues to maintain their semi-final push. Cork ignited their hopes of reaching the knockout stages after they soundly defeated Monaghan by 5-17 to 1-4 at a sodden Inniskeen. Orla Finn was the chief scorer with a 1-8 haul, while further goals from Áine Terry O'Sullivan, Libby Coppinger, Ciara O'Sullivan and Doireann O'Sullivan gave Cork the three match points. Finn was untouchable at times in this game, and all of the first five scores fell to the dangerous attacker. In Division 2, Armagh also kept their winning record intact with a 1-9 to 1-6 win over Tyrone in Garvaghey. After trailing by a point at the break, Tyrone took the lead with a goal, but Aimee Mackin punched her seventh goal in four games after the restart. Waterford claimed a 3-7 to 0-15 win away to Cavan, their second of the competition, while the game between Kerry and Wexford was postponed due to heavy rain in the area, as was Clare versus Laois. In Division 3, the game between Kildare and Offaly had to be abandoned before half-time as conditions worsened dramatically. Roscommon picked up their third win, with Niamh Feeney's first-half goal proving crucial in 1-7 to 0-8 win over Down.